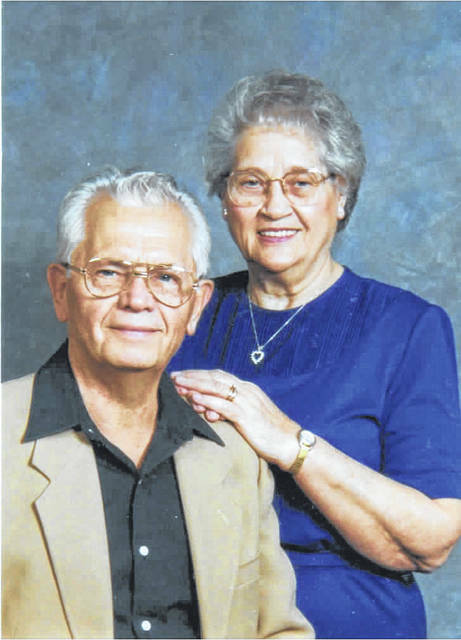 Jim and Jackie (Miller) Reed, 31365 Noble Summit Road, Middleport, Ohio, will celebrate their 75th wedding anniversary on Monday, July 16. Jim is retired from OVEC in Cheshire and Jackie has been a homemaker. They have faithfully served the Lord at the Bradford Church of Christ all of their lives. Their family is proud of the example they have set for them with their 75 years of faithfulness to each other and to God. The couple have two children, a son, James David (Phyllis) Reed, Carroll, Ohio, and a daughter, Ruth (Ed) Durst, Middleport, Ohio. They have four grandchildren, Tim (Kristi) Durst, Jimmy (Julie) Durst, Tad (Melissa) Reed, Elizabeth Reed and six great-grandchildren, Jarret, Trenton, Hannah, Cole, Josie Durst and Alexa Russell. They will be celebrating at their home with family.